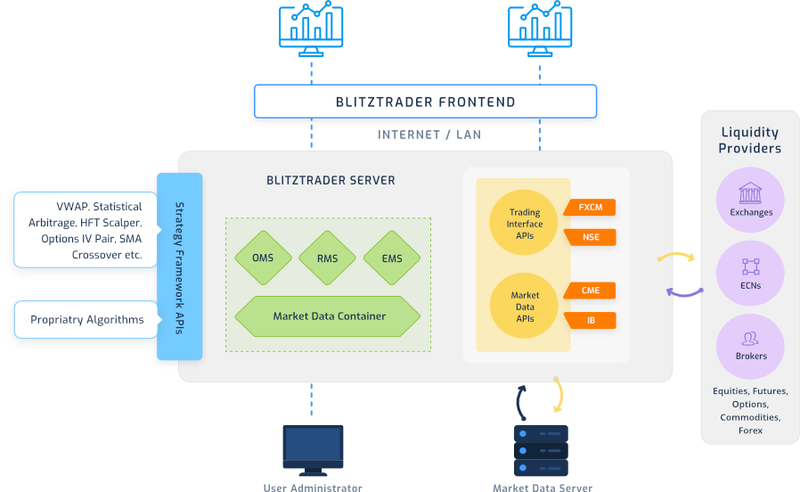 BlitzTrader is next generation, most powerful and flexible algorithmic trading platform for quantitative hedge funds, investment bank, prop desk and professional quant developers for rapid development, testing and deployment of simple to sophisticated trading strategies into constantly evolving financial marketplace. It is designed to increase trading execution efficiency and profitability by capturing alpha. 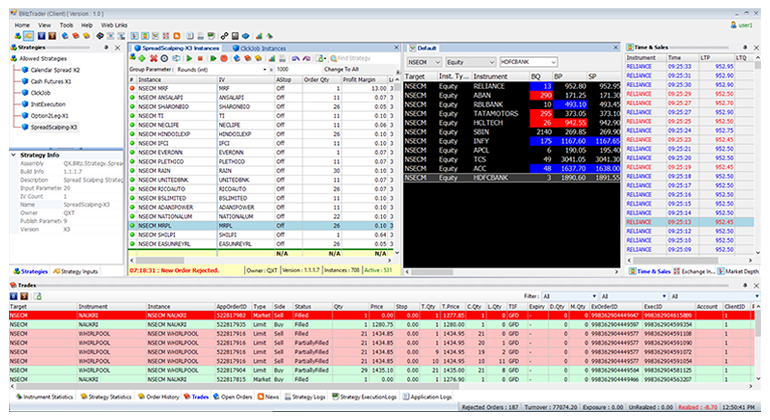 BlitzTrader combines powerful features such as, multi-asset trading across multiple liquidity venues from your algorithmic trading strategies with comprehensive risk management system to ensure safety and soundness of your financial systems. It manages end-to-end automated trading lifecycle including market data feed, risk management, order management syst m, order routing and deliver exceptional trading experience with extensive range of advance features. Build on the top is BlitzTrader API and open framework to transform the system to your own customized needs. 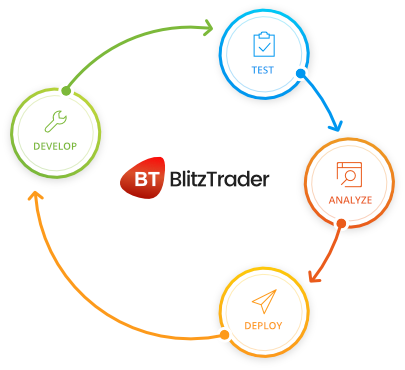 The BlitzTrader API enables quant developer to quickly develop, test and integrate proprietary trading strategies, exchange adapters, trading tools to create the best automated trading experience. 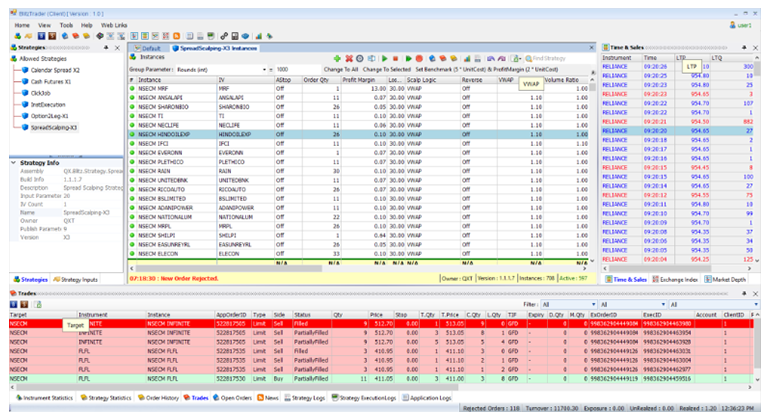 The BlitzTrader core engines are low latency by design, typically able to execute in microseconds. 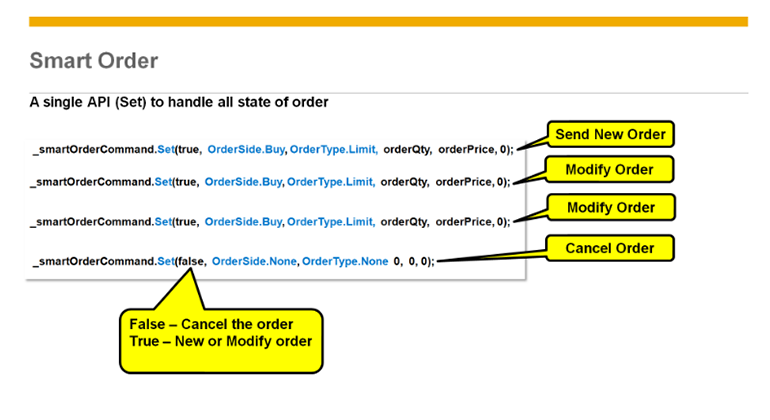 Powerful concept of smart order API, allow you with single line of instruction to generate new, modify and cancellation of order. 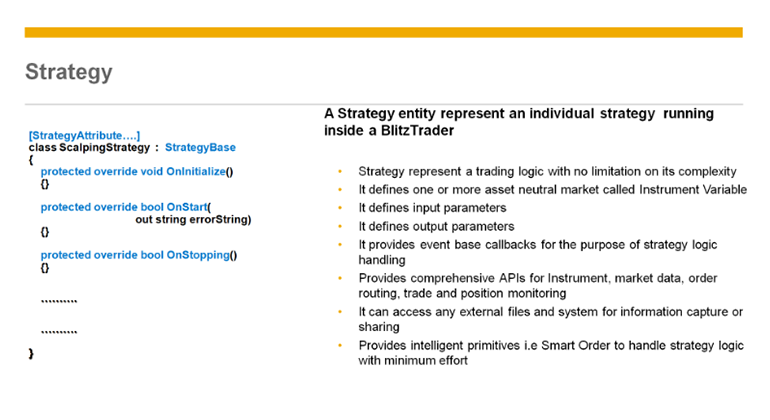 Blitz integrated Risk Management provides extensive protection against trading errors on all possible levels. 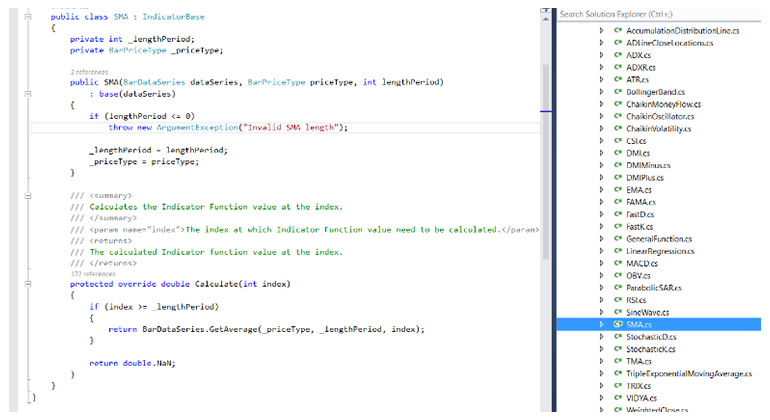 C# based API provides no limit to integration and running complex trading model across markets and asset class. The source code options save big investment to develop a propitiatory trading system from scratch and cost much less than investment required. Most other strategy development framework provides individual API for create, modify and cancel order. This involves complex development in managing the order state. Blitz Smart order API with single line instruction manage all the state of orders without getting in a risk of loop of continuously order sending. The platform has been engineered in C# and provide a powerful and easy to use strategy development framework to develop a proprietary strategies with fast time to the market. Blitz API offers advanced development capabilities through full integration with Microsoft Visual Studio 2013, allowing you to debug strategy code. Several investment management companies have specialized in exploiting news driven trading strategies that would affect the future sock price. Event driven hedge funds need to be on constant alert on news and company press releases as any potential profits could be “arbitraged” away after a short period after the event has taken place. Many news agency providers also provides low latency machine readable news feed that can be directly used in Blitz trading strategy to exploit sudden price movement.